It takes more than a bold attitude to transplant an architectural concept – particularly one that is foreign and historical – to local context. There is the necessary understanding of design genesis, a sustained exposure to context, and the technical ability to transport even just a small element and make it work. Trust local architectural practice RT+Q to accomplish this feat with panache. The firm’s body of work has continuously drawn lessons from the great spaces of the past. As an assistant professor at Syracuse University, its principal Mr. Rene Tan did research on classical architecture, with a particular interest in Palladio. This year, Mr. Tan also led a Palladio option studio at the Singapore University of Technology and Design (SUTD). In this particular residential project, RT+Q successfully incorporated a Palladian loggia and turned it into a highly functioning space. The project is located in the popular residential enclave of Serangoon Gardens, a two-storey semi-detached unit with a basement and an attic. 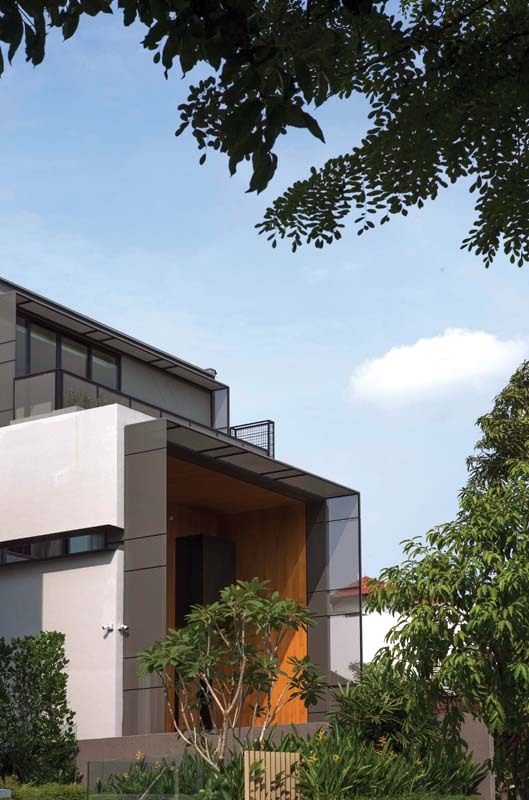 It is a multi-generational residence built for a Singaporean family, their parent and three school-going children. 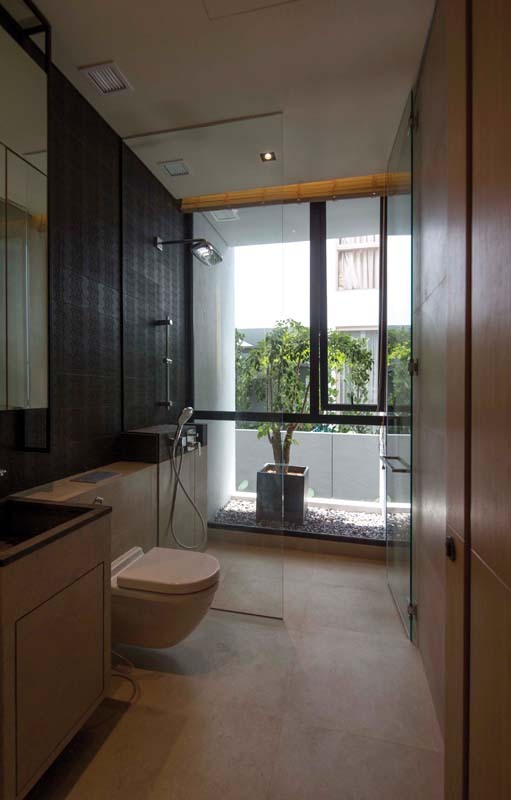 The client wanted a home that could comfortably accommodate the all members of the family and their needs, with a room built for mah-jong, and a large kitchen from which the wife, a keen cook, could dish out sumptuous meals for the family and visiting friends. The design, a straightforward response to URA’s envelope control requirements, frames both the first and second storeys with a timber-clad portal – a modern take on the loggias by the 16th century Venetian architect, Andre Palladio, as seen in some of his best known projects such as Villa Rotunda and Villa Emo. Its addition in this project simultaneously gives the house a distinctive street presence as well as provides much needed shelter from the rain and the afternoon sun. One of the client’s initial requests was for a double volume space, and for the first floor to be bright and airy. Thus, the loggia simultaneously creates the dramatic space while allowing the doors and windows within to be kept open for constant ventilation. The updated loggia is a ‘quotation’ of the great spaces in houses of the past, especially those of the High Renaissance. First developed in the predominantly agricultural region of Veneto in Italy, the Palladian loggia was a useful space where the occupants could sit and survey their lands and flock. Transported to modern-day Singapore, the loggia creates a sheltered space from which the house’s occupants can enjoy the tropical outdoors. In this project, the loggia is defined by a distinctive timber cladded double-height portal, which frames the house. It leads to a timber deck and water feature where the clients’ children can play outdoors. 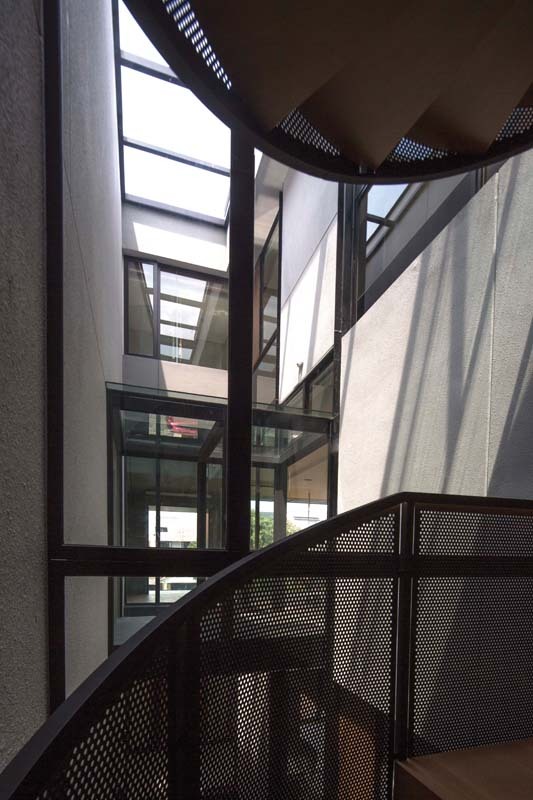 In order to draw light and air into the basement, the main living spaces were pulled away from the party wall, creating a four-storey-high atrium that fills usually dark, airless internal corridors with light, and more importantly, draws air throughout the length of the house whenever the operable skylight is open. 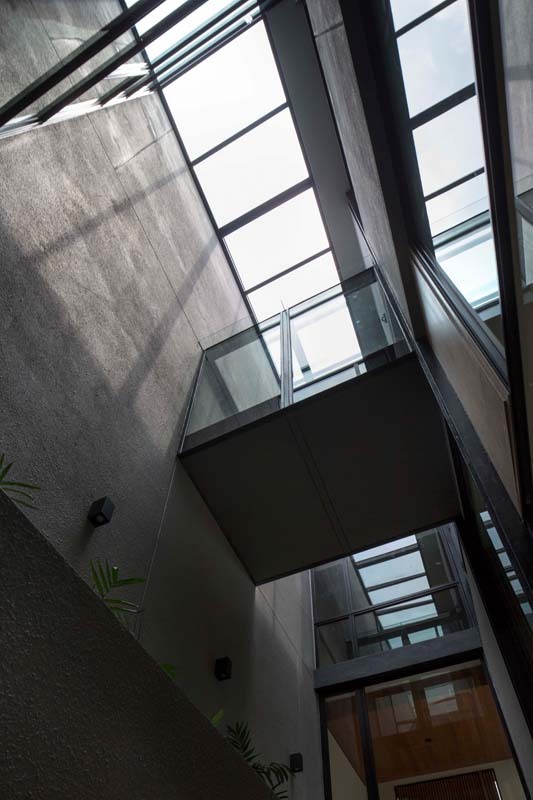 Glass and steel boxes puncture the void of the atrium, where one could play peek-a-boo across all levels of the house, and provide breakout spaces within different rooms. 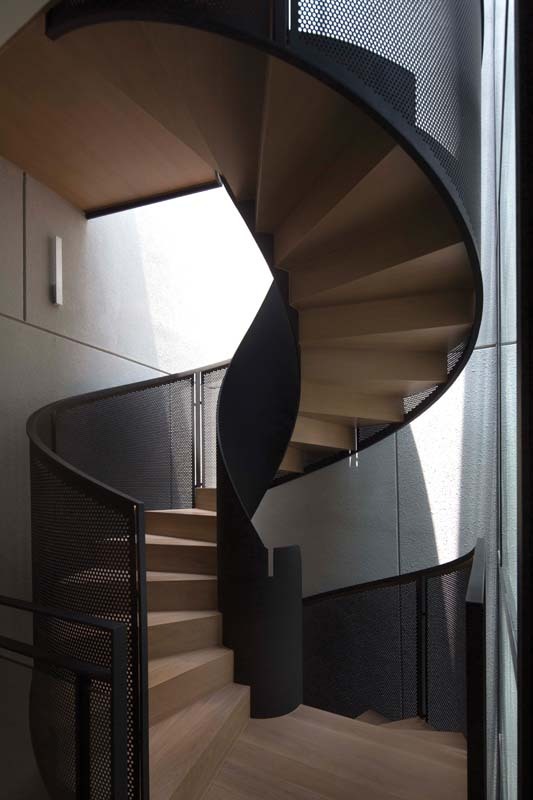 The circulation plan for the house is straightforward – shared spaces are located in the basement and first storey. The lift and spiral staircase are located at the rear end of the airwell. The dry kitchen and living room are at the front and lead directly off from the lift/staircase. 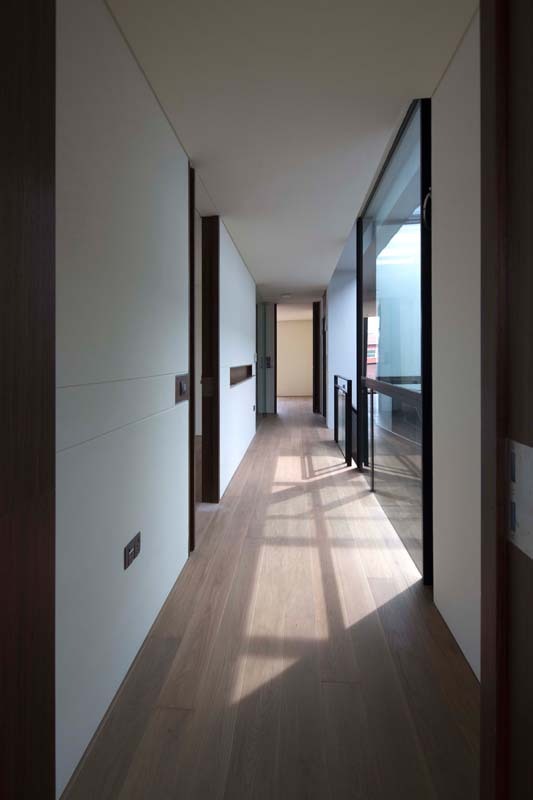 On the upper floors, a corridor connecting the bedrooms similarly runs alongside the airwell. The success of the design concept is evident in the way that the clients use the space. There are enough spaces for private moments as well as for being with each other, for coming together as family as well as for entertaining guests. And at the center of all these is the loggia.